That statement is so ridiculous. That´s like saying that McEnroe wouldn´t be so good if he weren´t left handed either or Connors. I don´t believe anyone has ever asked how much less slams Johnny and Jimmy would have if they were right handed? Or Laver for that matter. Truth is, leftys always have had an advantage in the history of tennis (especially McEnroe´s lefty can opener slice serve). This is no revelation. Should we disallow southpaw´s from tennis now? Why didn´t Marcelos Rios win anything in his career despite being left handed? I know he was a weird man but he had enough talent to win at least a slam despite his attitude. There´s a saying often used in football, ¨it is what it is¨. Federer is great, I wouldn´t worry about him. He´ll get his 15+ slams. I would bet my mortgage on it. But those statements about leftys just gets me everytime. Butters, I don't think that was Kingdaddy's point (KD, please correct me if I am wrong here). I think what KD was saying is that there would be nothing special about Rafa's game if he were right handed. A lot of clay court players play like Rafa with heavy spin and they get beat all the time. The difference is that Rafa's left handed game in combination with all the spin makes him something the other players do not see much of, so it takes longer to work out against Rafa's game. There are also fewer practice partners to work with to prepare for the reverse spins Rafa delivers. I also think that is why Rafa had such a bad second half of 2K6, as a lot of players have worked his game out. If you break the mechanics down, Rafa has a VERY good one dimentional game and he is working hard to make it better. The other intangible is Rafa's determination and belief. I think this is what makes Rafa so popular (along with all the fist pumping and bouncing around (the Tiger of Tennis)). Rafa reminds me of a cross between Moya, Courier and Hewitt, not a bad combination. To me this is not about Rafa. But about left handed players in general. I don't like when people say that left handed players would be less successful if they were right handed. We'll never know will we? If it were that simple let's just teach every kid to play left handed and they'll be great tennis players like Rusedski, Verdasco, Rios and Melzer. Heck, even Donald Young. It's not that cut and dried. Let's speculate how many slams McEnroe would've won instead. I used to hear that stuff back then all the time. Just brings back memories. 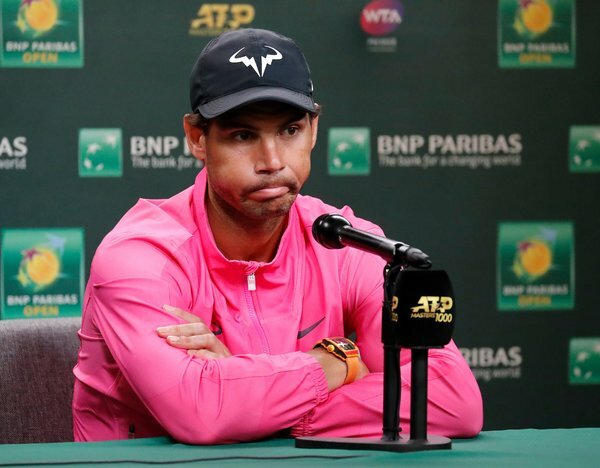 As much as I would like to see Nadal winning Miami, I think his foot issues are serious and he is not at 100% so I wouldn´t be surprised to see him losing to Del Potro or Djokovic. The most important thing for him is to be healthy and full of confidence to start the clay season. LoL, wouldn't have made any difference if Federer lucked his way through today, Nadal would have absolutely OBLITERATED him in the final. Let's all hope is foot okay. Yeah, and also you are so lucky because if you had played against Federer, you would have gotten thrashed out of the court as well. But well it is up to Nadal He knows more than us...SO VAMOS RAFAAAA ENJOY THE MIAMI QUARTERS !! Spoken like a true Fed loverboy. Simon's just winding you Fed boys up and you take the bait. Fact is, we'll never know. Either player, Fed or Rafa, has a good chance of beating the other. We'll never find out because Canas knocked Fed out. Was right about IW, wrong here. Ooops! Djokovic ruined your party. As a left handed player myself, I know that I have won matches simply for that reason against players I should never have beaten. I used it to my advantage. Why do you thin Uncle Tony made right handed Rafa play left handed??? Like Rios and McEnroe, Nadal is a natural talent but his gift is his tenacity, footspeed and being left handed. Soon he will lose two of those gifts footspeed ( I believe due to injury, his playing style is too hard on the body) and the left handed suprise will wane also (as it did for McEnroe). He will still be a great champion but others will come up and severely test him (and Fed for that matter). Djokovic has already taken the page out of the Blake/Youzhny book on how to top Rafa (only after the third time playing). This year will be Rafa's test year as he is not a suprise anymore and people know how to play him now. BTW, when McEnroe first burst on the scene, he was kicking a**, but as time went on he won less and less. Partly to due with the fact that his opponents learned how to play against a left handed ball. Go check the history and stats on some other left handed players and you will find the same results. The Sureshian curse is lethal. Nadal will beg him not to make TT threads saying he has a feeling Nadal will win XYZ. You saying sureshian curse is more lethal than sewreshian double curry squat? The vice is too much there. Has sureshs ever been right with one of his prediction threads? Time to do the annual bump of this Suresh classic. Phuck Sureshs!! Now I see why Nadal never won this thing. Da Real Slam and this thread, Resh is a gift that keeps giving. Poor Nadal's been screwed from the start and he never even realized. LOL! Forget Fedr, Djovak, injuries, only one clay Slam and blah blah blah... It's Sureshs' curses that denied Ralph being the GOAT. I wouldn’t be surprised if he decides to shut it down and focus on the European clay stretch instead.